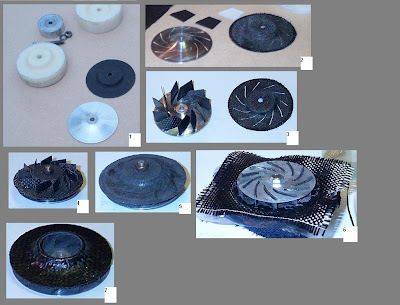 Just to let my readers know that I haven't given up and gone away ;-) I'm posting this composite picture of the stages in making a CF impeller. The reason it's been a while since I posted is that I'm remaking the entire engine compressor section and some of the parts take a while to make. The impeller in particular. It doesn't take long in terms of time spent, but the bonding/glueing processes take 24 hours at each step. The process starts (frame 1) with an aluminium boss shaped on the lathe with a nice smooth 'conical' curve to help the airflow. A similarly shaped laminar plate for the coverplate is made in CF (two layers). In the shot you can see the two parts of the mould I used for this job, turned out of a bar of nylon. Frame 2 - The boss and cover are slotted to take the curved blades. The slots are started using a 'Dremel' tool router bit (0.8mm). I roughed them out using a piercing saw then finished them with the router bit, this time using a pillar drill at high speed. After cutting, I glue the blades into the boss and leave to set. Frame 4 - The fiddly bit! The cover plate has to be persuaded to fit over the blades and eased down to be parallel with the base boss. A spacer is inserted between the two parts and helps a lot with setting the plate correctly. I could probably get more accuracy using jigs here but the end result is acceptable for the prototype. Frame 5 - After glueing and hardening, the blades are trimmed down to the cover plate (using the Dremel again and finishing with a spin in the lathe using glasspaper) and then (Frame 5) a final layer of CF is bonded over the cover plate. Frame 6 - The impeller is mounted in the lathe and the inner orifice is roughed out allowing the spacer to be removed. All that remains is another layer of CF to be bonded over the bottom of the boss for added strength and the whole thing can then be trimmed to size and polished up.